ATTENTION ALL HANDS. ALL-NEW #114 HAS UPLOADED. CLICK HERE: https://www.spreaker.com/user/7338953/114-july-23-2017-the-blazewick-document TO LISTEN/DOWNLOAD THIS PODCAST (and entire podcast archive) FREE. IN THIS EPISODE~ You & I will dissect and analyze an obscure witness statement found buried in The Weisberg Archives by our friend Ted Rubinstein. John Blazewick came out of the cold~and out of the blue~ to Weisberg in 1967 with a strange story of Cubans, Mercenaries, and Lee Oswald. Parts of his story strain credulity, other parts are verifiable, and one or two of Blazewick’s claims actually foreshadow connections only illuminated in later years by researchers. ATTENTION ALL HANDS! ALL NEW #113 HAS UPLOADED! 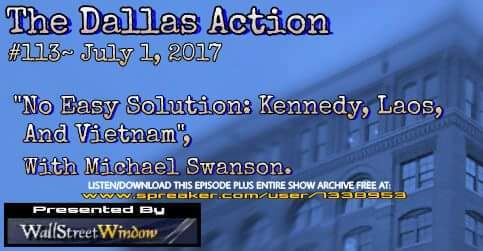 CLICK THIS LINK~ https://www.spreaker.com/user/7338953/113-july-1-2017-no-easy-solution-kennedy TO LISTEN/DOWNLOAD THIS EPISODE (plus entire show archive) FREE. IN THIS EPISODE~ Author & historian Michael Swanson (“The War State”) is back on the show to give us a preview of some research and analysis contained in his as-yet-untitled follow up to “The War State”, a book that will focus on The US National Security State and South East Asia. Using portions of his manuscript and Primary Resource Documentation, we’ll follow along with Michael as he leads us through some lesser known corners of the history of the United States’ involvement in SE Asia, discuss the motives of people like Walt Rostow and General Curtis Lemay, and why Michael thinks that~regardless of what some may urge~asking “How?” is every bit as important as asking “Why?”. ATTENTION ALL HANDS! ALL-NEW #111 HAS UPLOADED! CLICK HERE~ https://www.spreaker.com/user/7338953/111-june-9-2017-of-mercenaries-and-the-m TO LISTEN/DOWNLOAD FREE. 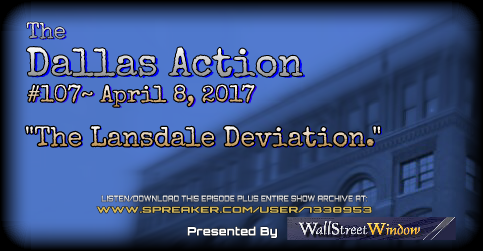 IN THIS EPISODE~ Ted Rubinstein is back for the first segment to share his continuing study of the movements and connections of I. Irving Davidson, an arms trader/financier with shady connections to folks with names like Hoffa, Hemming and Hunt, and we’ll detail how Davidson inserted himself into the Garrison Matter in 1967. 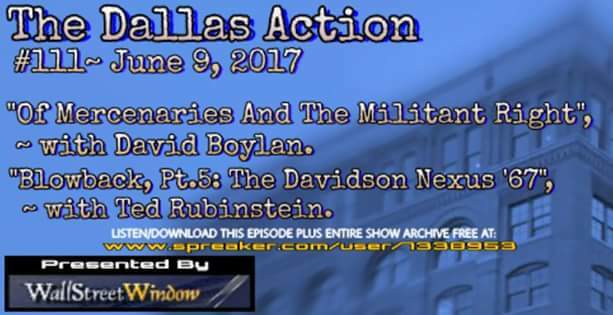 In the second segment, we’re fortunate to have a conversation with researcher David Boylan, about his seminal article “A League Of Their Own: A Look Inside The Christian Defense League”, which details the California Militant Hard Right and the former Army Intelligence officer who led them, a Minutemen/John Birch Society bigwig in whose orbit floated mercenaries like Hemming and Howard, ex-Generals named Walker, and around whom rumor and innuendo have swirled since the events of 11/22/63. IN THIS EPISODE~ The longest episode in our show’s history sees the return of Doug Horne! 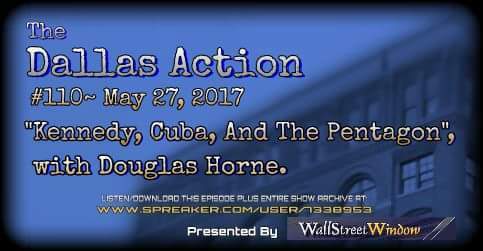 After a 2 & 1/2 year absence, Doug is back at the table with us for a conversation about Kennedy and the Problem of Cuba. Mr. Horne will be speaking on these very issues at The Future Of Freedom Foundation’s “The National Security State And JFK” Conference to be held in Washington DC next month, June 3. From the earliest days of the Kennedy Administration, through The Bay Of Pigs, Operation MONGOOSE, The Northwoods Documents and beyond, we’re going to discuss it ALL, in detail, with Mr. Horne. IN THIS EPISODE~ In the wake of the cold-blooded murder of our Hapless Patsy, Lee Oswald, by Mr. Ruby, a myriad of individuals came out of the woodwork, claiming knowledge of a relationship and/or personal ties between the two doomed men. You and I will examine several of these claims & witnesses, and endeavor to separate a little wheat from a massive amount of chaff. Some are immediately credible, some seem so on the surface, and some~including perhaps the most well known claims~just never pass the Smell Test. IN THIS EPISODE~ Ted Rubinstein is BACK for a 2-segment episode. * First, Ted & I will update you with collaborative research into the Harold Weisberg/Loran Hall story we detailed in #103, and we now have a much better idea of WHAT evidence was involved, how the entire affair went down & when, and WHO all was actually involved…and you may be surprised at a few of the names. *PLUS, we’ll continue the “Blowback” series, as Ted lays out more new info regarding his studies into the Gene Wheaton/Assassination Records Review Board allegations. Research In Real Time. Learn as we do. IN THIS EPISODE~ Since the release of Oliver Stone’s film “JFK” and the widespread exposure of the works of L. Fletcher Prouty it has, it seems, become practically an act of heresy to suggest for a moment that Air Force General Ed Lansdale was *not* the Operational Mastermind behind Dealey Plaza. (And to suggest that Lansdale MIGHT NOT be the man in the 3 Tramps photo with his back to the camera will actually get you *called names*, too. TRUST me). By the Conspiracy Believers, we are told that Lansdale was an Operationally Gifted Covert Ops Golden Boy, lauded and respected for his Clandestine Genius and by everybody in DC that mattered, including deposed & disgraced ex Agency head Allen Dulles. PLUS~ using nothing but Primary Resource Material discovered at the Kennedy Presidential Library earlier this year by author Michael Swanson, you and I will *completely* dispell & dismiss the idea that it was Allen Dulles who went to Air Force Chief-Of-Staff Curtis Lemay and got Lansdale his promotion to General, and you may be surprised to find out just who DID.